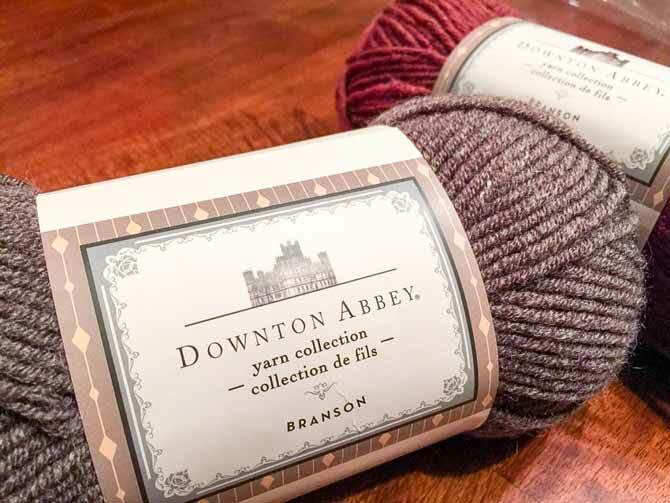 There are several patterns available for the Branson yarn which highlights this thicker weight of yarn. 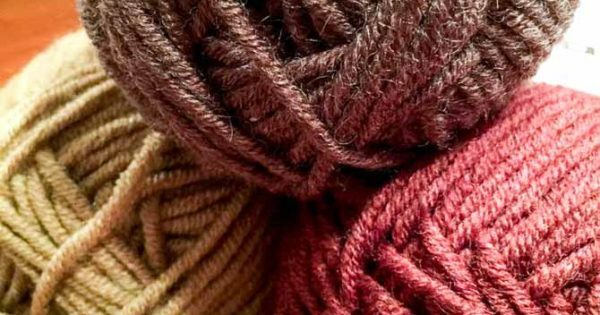 Let’s go over these scarf, throw pillow and sweater patterns and see what it’s like knitting with Branson yarn. Branson in colors Lichen Green, Claret Red and Chestnut Brown. The Mirrored Cables Scarf is the first project that drew my attention because a scarf is one of the most universally acceptable gifts I have ever knit. Some people don’t like wearing hats or mittens in the winter, but scarves seem to always be welcome. This scarf in particular has cabled edges and a triangle stitch pattern in the middle. 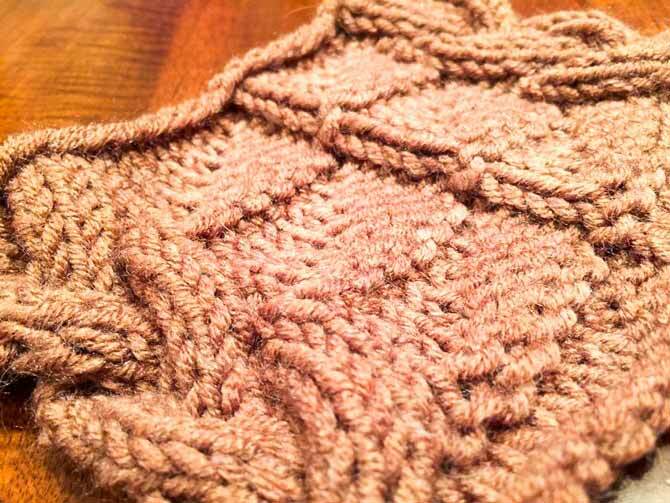 At first I was a little put off because there was no chart to go with the pattern, but once you start knitting the design is very intuitive. You’re able to see where you change your stitches within the pattern. If you’re the type of person who’s very attached to charts, I would suggest making your own! You’re definitely able to do this with a bit of graph paper, or if you have excel on your computer. With excel, just shorten the column width so the cells are square and place X’s in the boxes for purl stitches and leave the knit stitches blank.You would have to use your own symbols for cable left and right though. It would be your own creation, but if it helps you knit something this lovely, I would say it is worth it. A swatch in the Mirrored Cables Scarf stitch pattern using Branson yarn. The next project that caught my eye is the color work in the Drawing Room Pillow. I really love color work and find it very therapeutic, so I’m a bit biased towards this pattern. It’s knit in two pieces, three edges are sewn together, it’s stuffed and the last edge is sewed up! Purling in Fair Isle is a slightly more advanced technique and you have to keep an eye on what you’re doing; when you purl your way back, you are reading the chart upside-down. I find it useful to actually turn the chart upside-down so I have a more realistic viewing angle to concentrate on my knitting. 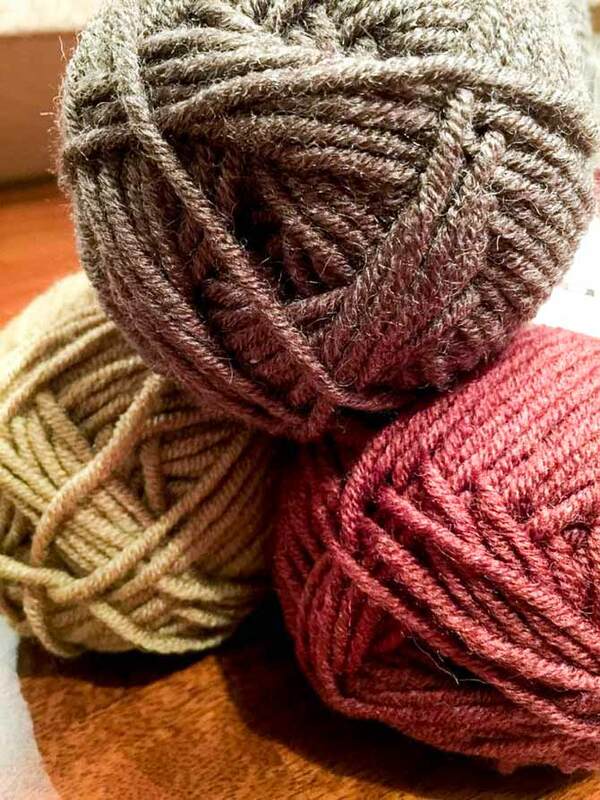 Branson yarn available in Chestnut Brown and Claret Red, ready for color work! If you want to make the Drawing Room Pillow, but are concerned about not being able to purl Fair Isle, another tip is to simply use a Turkish Cast On or Judy’s Magic Cast On. Cast on twice the amount of stitches you need for one panel and knit the pillow in the round. When you get to the top you can bind off, stuff it and seam up the top, or stuff it then use a three needle bind off or Kitchener stitch. Judging from my undying love of Kitchener stitch, I’ll bet you can guess what I would use. Last, but not least, is the Boxing Day Cardigan. I left this project last on my list because sweaters scare some knitters. It’s seen as a gigantic undertaking and may come across as slightly daunting. I thoroughly enjoy knitting sweaters because I have the biggest sense of accomplishment when I’m finished. This cable pattern will go very quickly as well. It’s not very complicated and if you use pattern markers to remember where your cables are, you’ll fly through it in no time. This sweater is done in pieces and seamed up at the very end. This just means you can enjoy the small victories of completing small pieces and the big finished project victory when you’re completely finished and everything seamed together. With the Branson yarn categorized as a bulky weight, it won’t take very long to complete it. All these patterns look very cozy with Branson yarn; the thickness of the yarn gives a plush softness that can’t be faked. The sweater and pillow would be perfect to curl up with on the couch and read a book, while the scarf is the ideal accessory for the very cold weather on it’s way. Knit fast, and let Branson keep you warm. I’ve enjoyed this series. 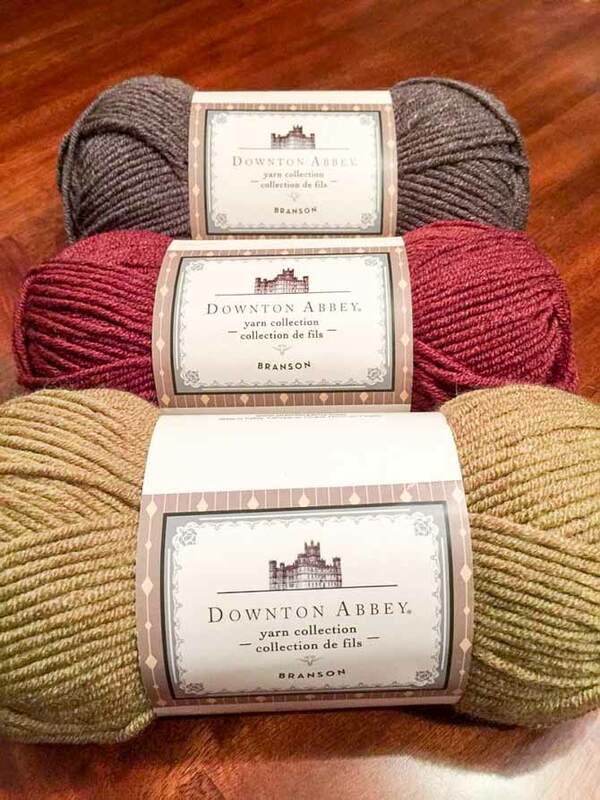 I hope there are more Downton yarns–like a Dowager yarn in silk. All great projects in Branson yarn. One of these days I’m going to be brave enough to try colour work like the beautiful pillow above.